Synced Warriors is a puzzle game where each button press controls all of the characters on the screen at the same time. The main feature of the game is that each character moves relative to the direction they are facing. 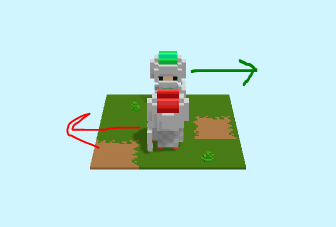 This means that if you instruct the characters to move left, they do not move to the left relative to the camera. Instead, they move left relative to the direction they are facing. 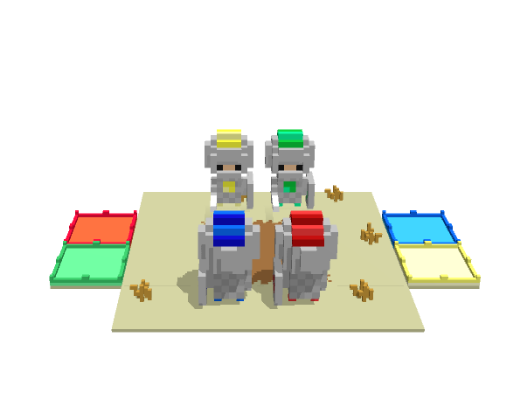 This makes for some interesting puzzle situations as you attempt to orchestrate a battle between the forces of red, blue, green, and yellow. 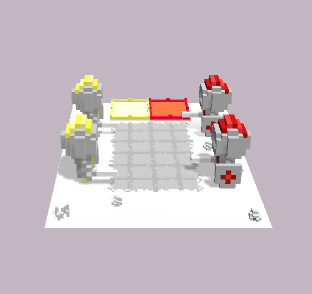 The goal of each level is to get a soldier of the correct color onto each of the puzzle pads. 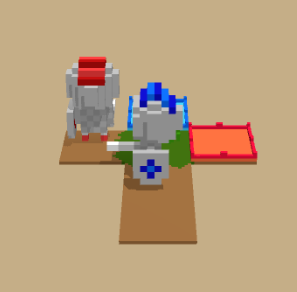 In addition, you need to have exactly as many soldiers on the level as puzzle pads. So, not only do you have to worry about moving soldiers to puzzle pads, but you also have to kill the extra soldiers. In the above screenshot, yellow has to reach the top right of the level, green has to reach the top left, and red has to die. This project was born out of two other projects. 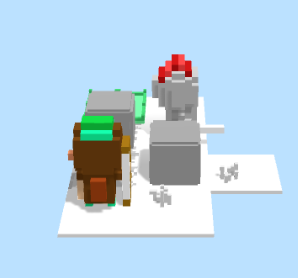 The first was a Sokoban style entry to Ludum Dare that I was super depressed about. 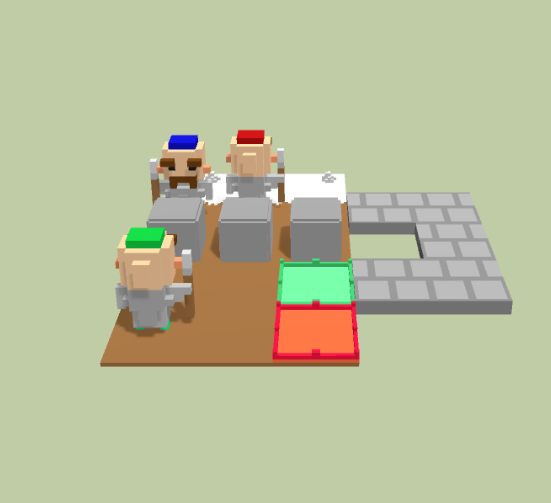 The other game was a project I have tried and failed to make many times that involved multiple characters in separate worlds being controlled by the same inputs. I'm pretty happy with the current incarnation of these projects. 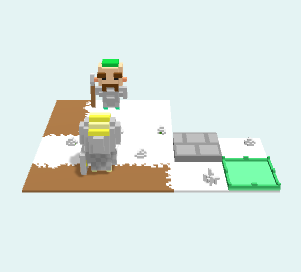 In addition to the puzzles, there is an infinite mode where new soldiers are generated and the player must keep the population below a certain point. 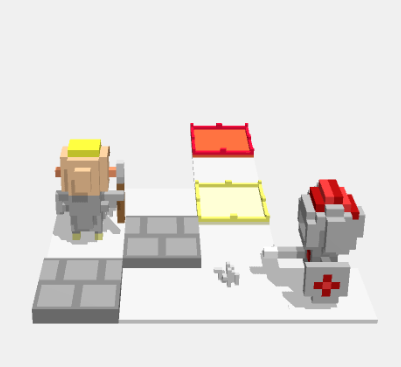 In the infinite mode various obstacles appear randomly and the game grows more difficult the more moves you make. 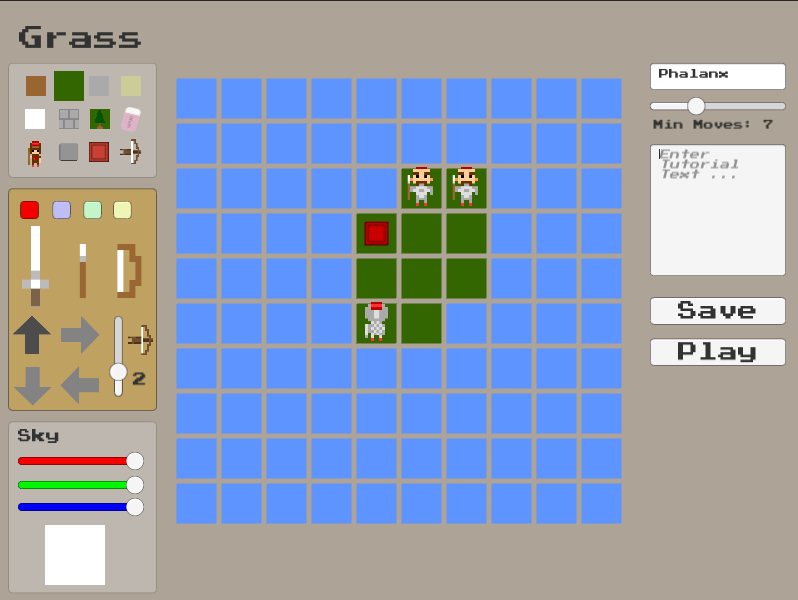 I also have an idea for a multiplayer chess-like version, but I'm still working on the rules of the game. A link to the game page will be available when I get a short demo ready in the next week or so. Subscribe to receive updates as I add them here over the next few weeks. I hope to have the game released in the next 2 months. 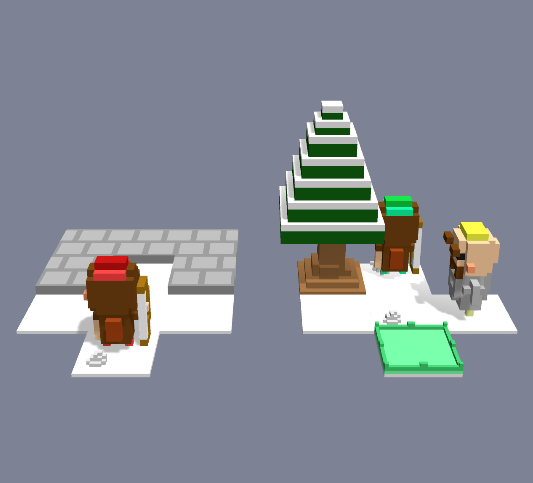 Much more interesting levels are in the works, but first I need to fix some bugs and complete the assets. 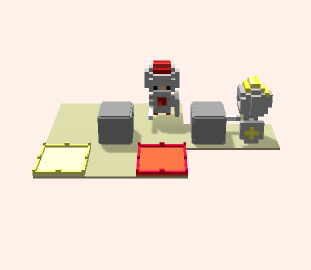 In the coming days I will make animations for the characters movements so they don't just teleport from tile to tile. Hopefully that will make the game look less jumpy. 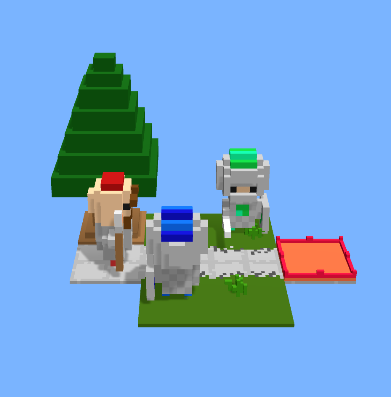 Also on my plate is completing the infinite mode, which now just needs balancing. Expect a demo up in the next week. I just made the game page public at https://tallshrimp.itch.io/synced-warriors and I've uploaded a beta demo of the game. If you have time, please give my game a try. I'm hoping to find out about as many bugs as I can, since I start to ignore non-game breaking bugs to the point that I don't notice them much any more. I'd also like any feedback on the gameplay. I'm curious about how hard it is to learn the movement mechanics, and whether I should tweak any of the rules for how the warriors move (e.g. when they collide on the same tile). I've been watching your game's development on here. I love the lowpoly stuff. I've been working on the level editor for the last week. I've got it pretty much done. I revamped the ui from the horrible design I had been using and I hooked it up to a database to store user's levels. 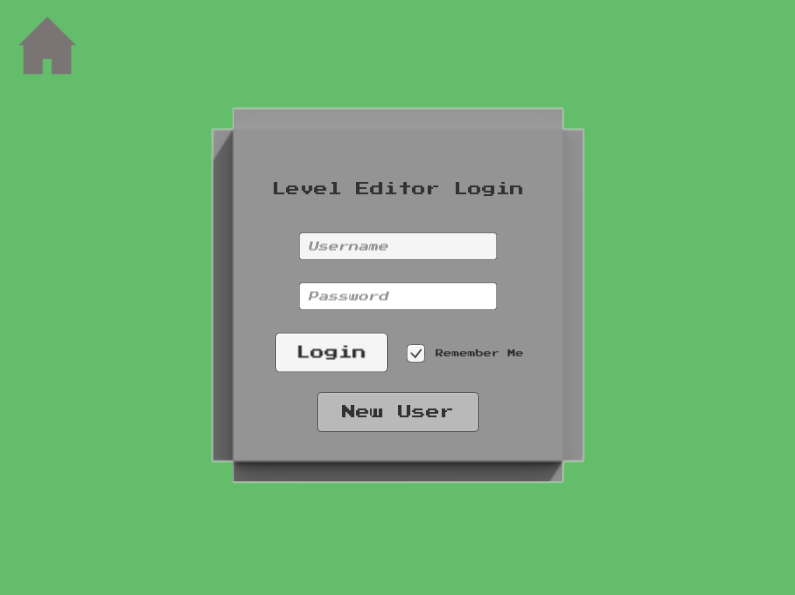 There is a login system for keeping track of user created levels. 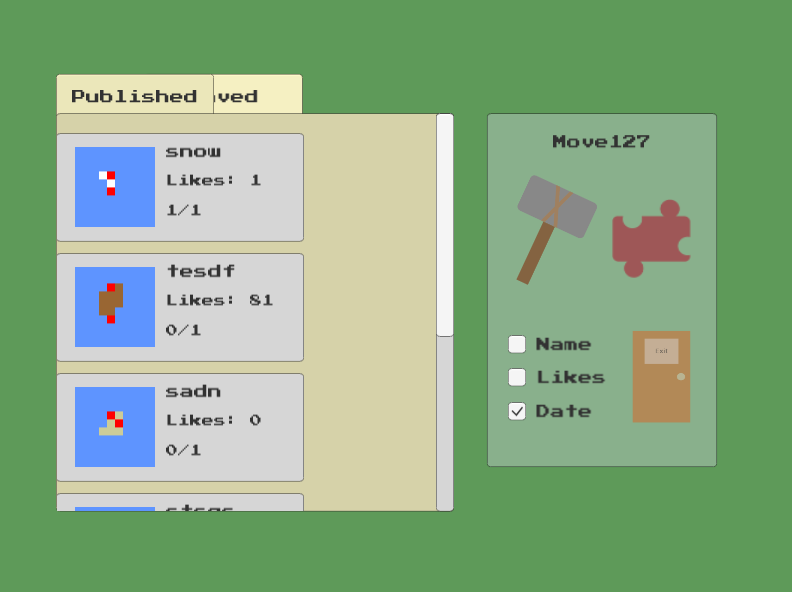 I still have a lot of work left to do on the ui. I will be travelling for the next 2 weeks. 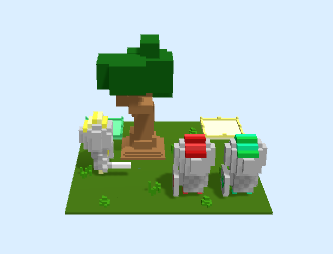 I'm planning on making levels while I'm gone so I can release the game shortly after I get back. Well ... between travel and my dissertation I haven't had much time to work on this project. However, I have now completed all of the levels. All I have left to do is fix the UI, add a password reset for the user created levels login, and improve the touch controls for the mobile version. 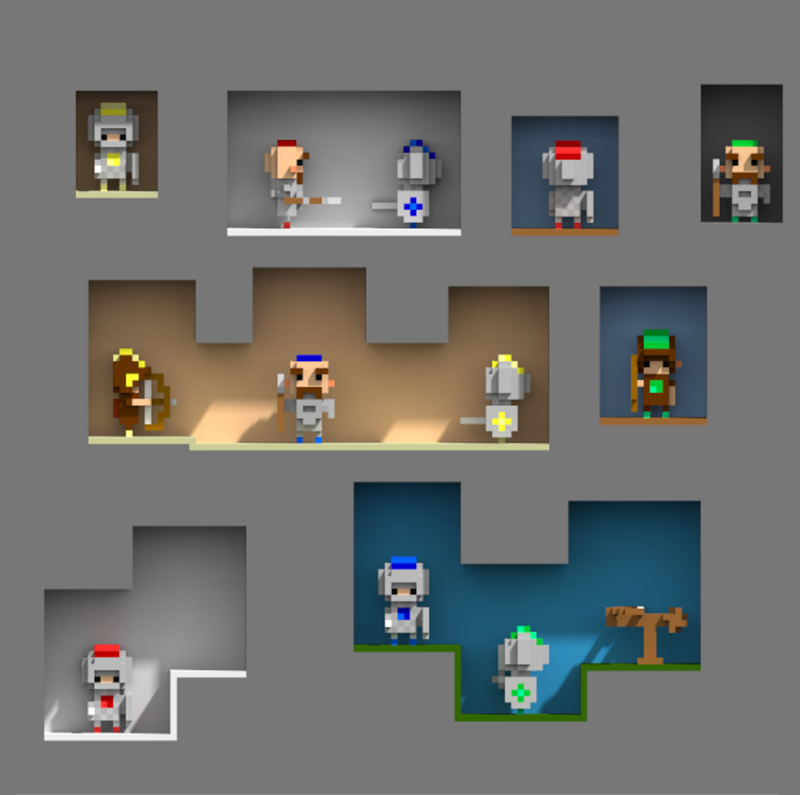 Here are some screenshots of some of the levels. I just "released" version 1.0 of Synced Warriors here on itch.io. A Steam release as well as a Google Play release will happen on January 8th. For now, you can get the game HERE for the price of a cup of coffee. That is, a cup of coffee I will drink while making games and avoiding my dissertation. There is a demo as well, so you can try before you buy me that coffee.